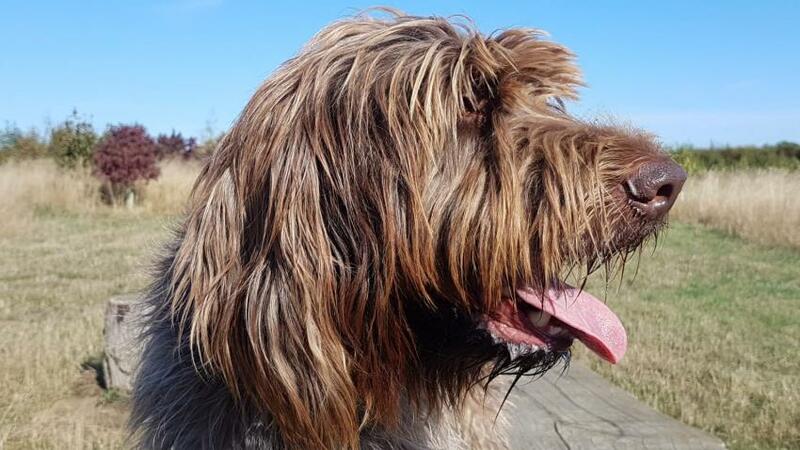 Developed in 1870 by the Dutch breeder Eduard Korthals, the Korthals Griffon was the result of selective crossing between German Griffons and Pointers, Barbets, Spaniels and a Setter, with many believing the English and French water dogs are its early forebears. Eduard Korthals wanted to develop a breed that was versatile in hunting, capable of tracking small game over a variety of different terrains; this was achieved within a mere 20 years, with Korthals successfully breeding as many as 600 Griffons. The breed was introduced to the United States in 1887, being recognised by the American Kennel Club the same year. Capable of hunting over water and land, the Korthals Griffon had to be athletically built, with strong limbs, a deep chest for enhanced lung capacity, wide nostrils and medium-sized hanging ears. The rustic-looking double coat, common in colour variations of grey, chestnut, roan and white, may have evolved in the breed as a means of camoflauge whilst hunting in open country, marshes or woodland Despite being an illegal practice in most European countries, tail 'docking' is often undertaken with this breed, although it is not a breed standard. The Korthals Griffon falls within the 'gun dog' branch of canines, sharing its classification with the Spaniels, Retrievers, Pointers and Setters. An energetic and skilled breed, the Korthals Griffon is well suited to an active family lifestyle. Naturally curious, agile and enthusiastic, the Korthals requires firm leadership and consistent training from puppyhood in order to manage boisterous behaviours and exploit the breed's brilliant potential. Affectionate and sweet-natured, the Korthals Griffon will make a great addition to any home setting, providing a loving companion for the family or dedicated sole owner. In general, a Korthals Griffon will weigh 23-27 kg, with a life expectancy of 10-12 years when cared for accordingly. Genetic eye disorders have been identified in the breed, as well as cases of hip and elbow dysplasia, a common complaint across breeds. Besides this, the Korthals Griffon is typically healthy and resilient, susceptible to no serious hereditary or breed-specific diseases. Do you own a Korthals Griffon? Let others know what they're like!